Ever since we got our Land Rover Defender from the British Army some five years ago, we posed ourselves the question of where we would take it after the necessary rebuilt was done. 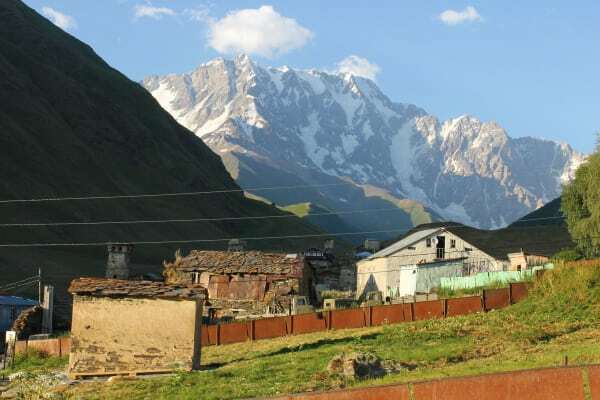 Upper Svaneti in Georgia came out as the answer. 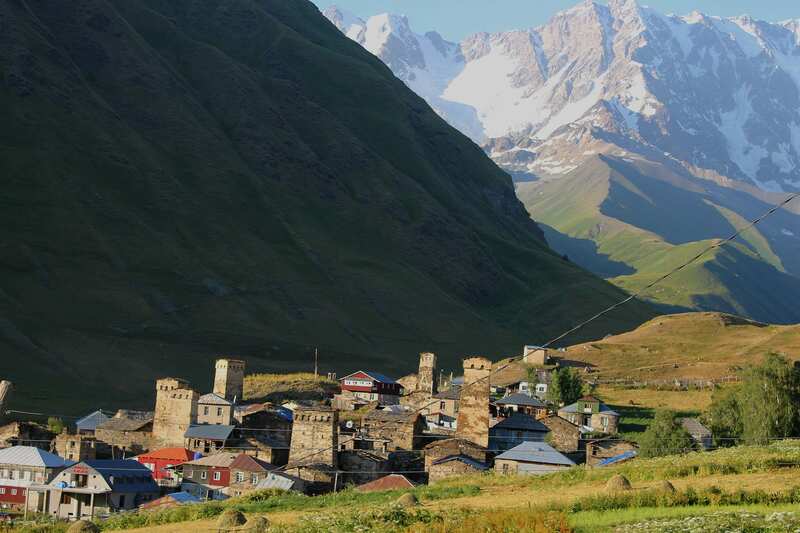 Svaneti has it all: pristine nature, a great cultural heritage and getting there was certain to be an adventure. On a warm and sunny August morning in August 2017, a month-long trip from Berlin to Georgia through the Balkans and Turkey lay behind us. Ahead of us, there was an 8 hour or 75 km long ascent up the almost non-existent path to Upper Svaneti from the Georgian lowlands. Some 25 years ago because of the high level of crime, this road used to be too dangerous even for the locals. Nowadays it is safe but even to this day Upper Svaneti, situated high up in the Caucasus mountains, remains one of the hardest to reach places in Europe. There are two ways to get there by land: one road leads from Jvari to Mestia and another from Lentekhi to Ushguli. 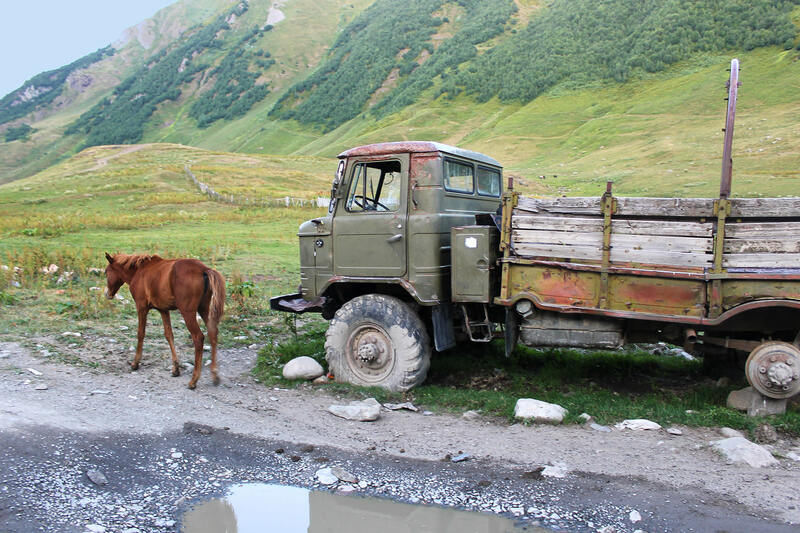 The first road is definitely in a better condition and there is public transportation from Jvari to Mestia. 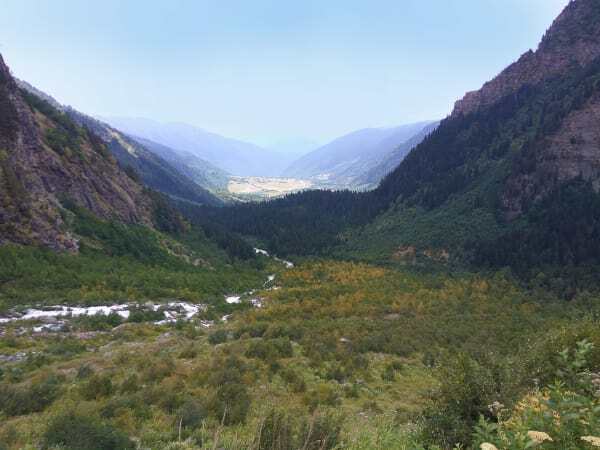 However, the second option, the mud and dirt track from Lentekhi to Ushguli, is so incredibly beautiful that it is worthy of making an effort to see this scenic road. 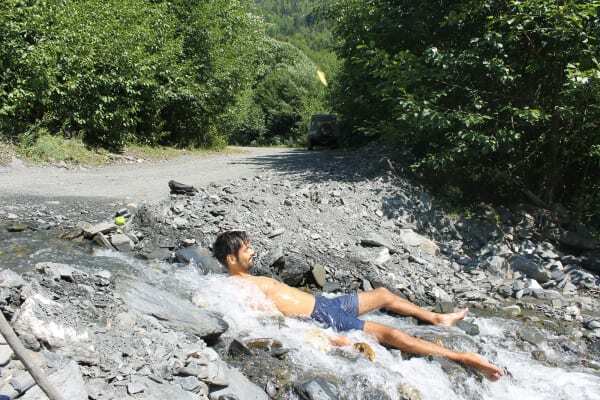 The whitewater river in the lush green valley, the authentic villages after Lentekhi, streams that literally cross the road and you may bath in, mountain meadows of flowers and the glaciers made getting to Ushguli to one of the highlights of our trip to Georgia. 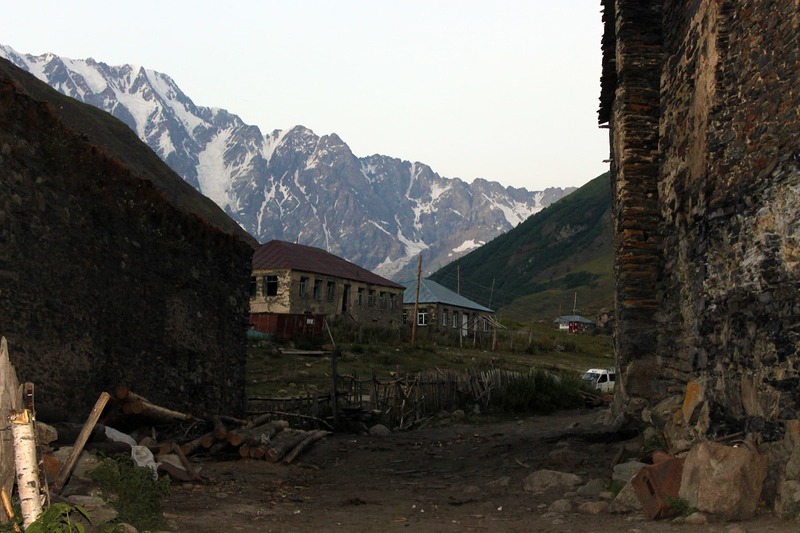 The evening in Ushguli is probably the most beautiful time of the day. The cold air comes down from the mountains when night falls. The towers, the houses and the barns hide the village in their shadows. There are some empty meadows around the village and we chose one next to the river, where a dirt road leads up to the glacier, for our campsite. 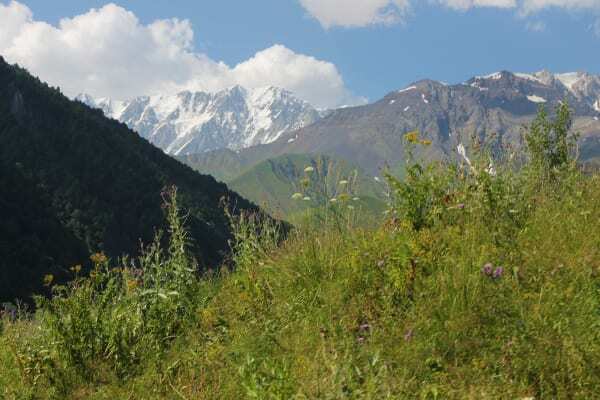 Now I should probably say a couple of words about Ushguli and Upper Svaneti and why this place was so special and attractive to us. 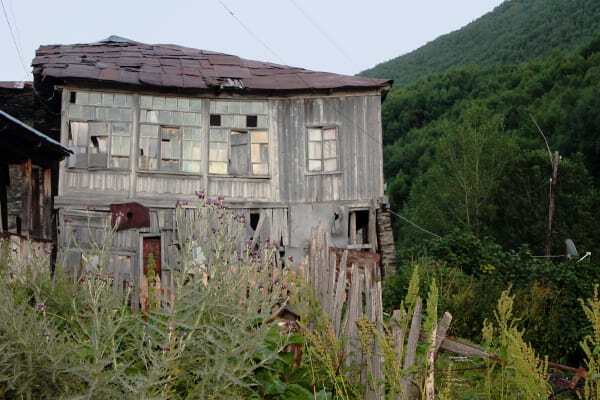 Situated on the Great Caucasian Range the village used to be cut off from the rest of the world for 7 months a year till the 1930th. 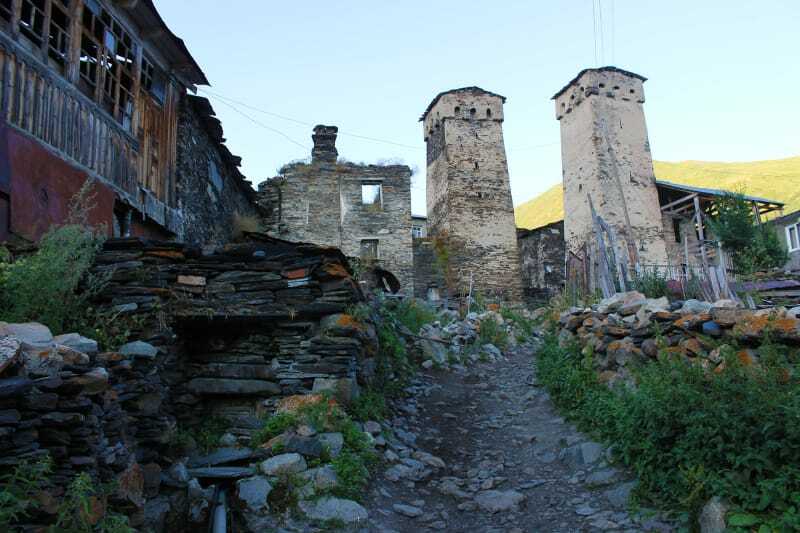 Due to the absence of roads and the difficult access, Svaneti managed to preserve a lot of its historic cultural artefacts – like icons dating to 9-12th centuries, old Bibles and a big part of its cultural tradition. And then it is so incredibly beautiful. There is a good documentary about the old Svaneti – “Salt for Svaneti” (1930) by Michail Kalatozov, a Georgian born director who later moved to Moscow and even got a Palme d’Or for one of his films (“The Cranes are flying”). 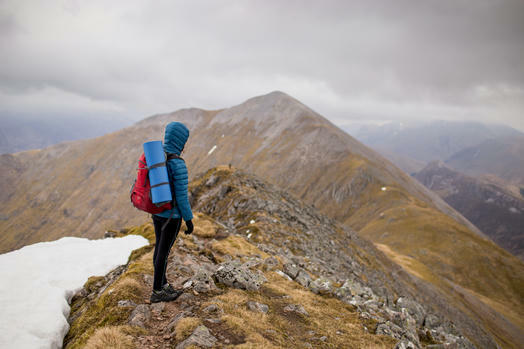 The most interesting fact is that he had to move to Moscow because of his Documentary about Upper Svaneti – the Svans did not quite like it and promised to murder him if their ways should ever cross again. I am a bit uncertain about what was so wrong about it from their point of view. 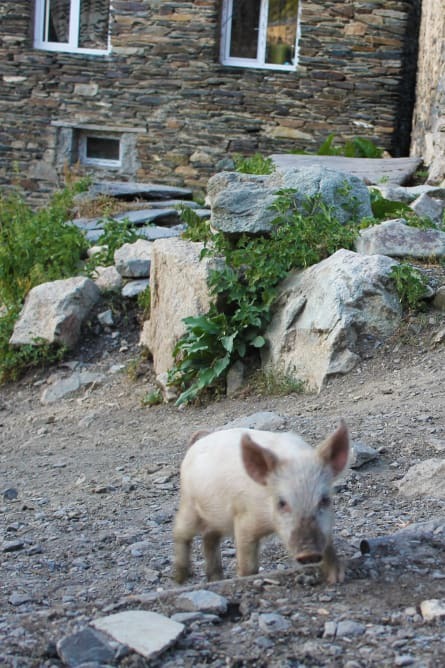 Following the good tradition of first praising and only criticizing afterwards, the film speaks well of the Svans as hard-working and admires their struggle against nature for survival. Then it actually shows a pregnant woman being thrown out of her home to give birth in the street, since giving birth is considered to be “filthy”. Then there is a Svan wake: all the possible respects are paid to the dead ones, money and animals are being sacrificed. But if the Svans were OK with keeping all these rights and even proud of their ways why were they so mad at Kalatozov for filming it? 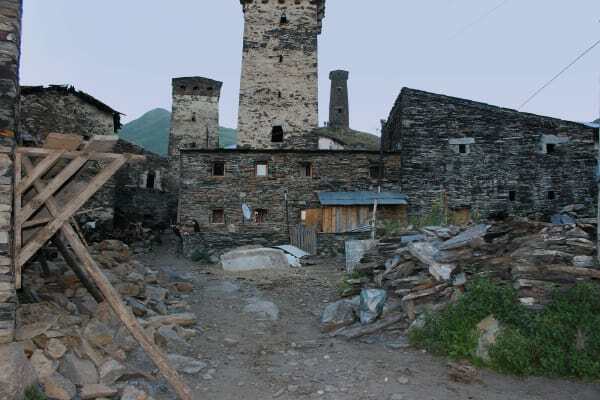 Maybe they were not fond of the film’s ending: Soviet workers are building a road to the mainland in order to end old prejudices and to open up the great communist future for Svaneti. 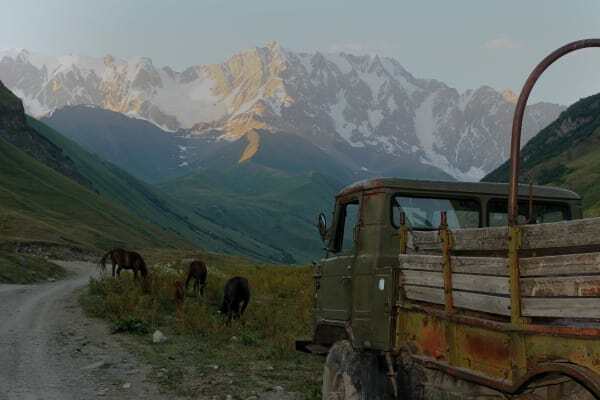 A point that I like is that the road is being built from Upper Svaneti to the mainland and the Svans liberate themselves according to the film. The whole thing means they were not enlightened by force by the Russian Soviets but made their own rational choice – how they suddenly came to the World Revolution from burying money with the dead ones remains not quite clear. 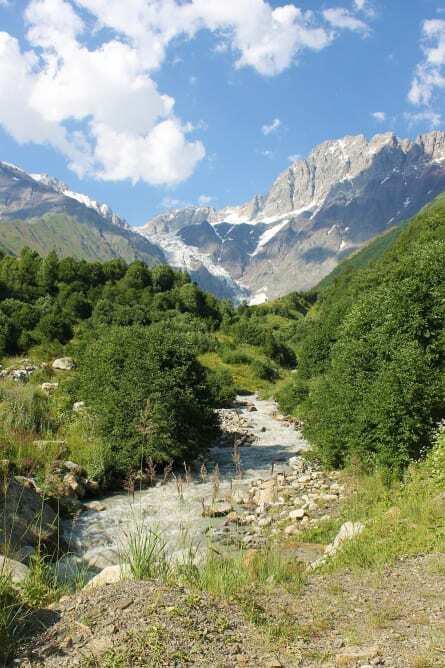 Nowadays you may still feel the wilderness of Upper Svaneti in Ushguli. But it was already commodified a little. To my surprise (I have heard some 20 years ago it was dangerous even for Georgians to be here) the place was full of travellers from all over the world. 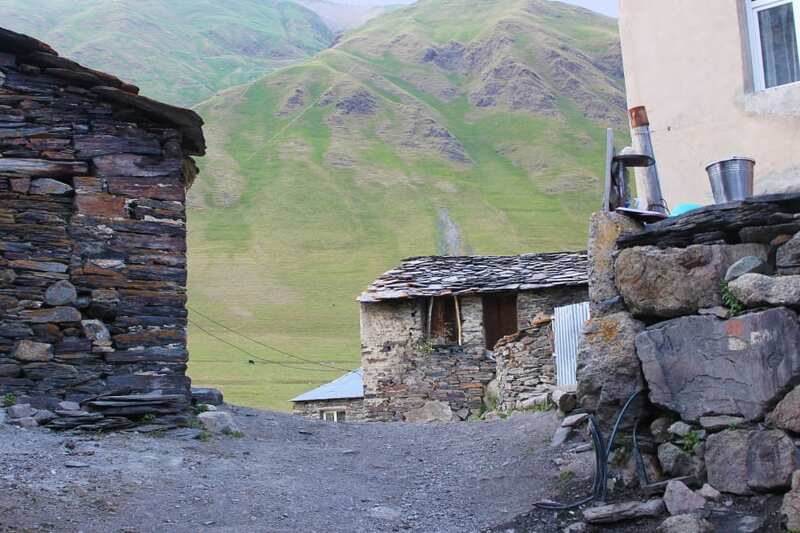 Lots of houses rent out rooms, supply hungry hikers with Georgian meals and some provide taxi services offering to drive visitors wherever they would like – to the glacier or even to the next town Mestia. Chapter 2. 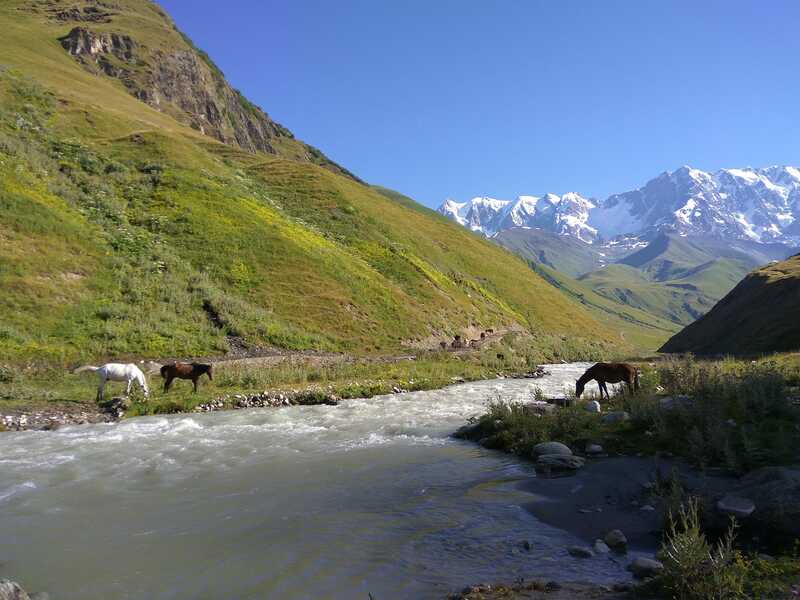 Exploring Upper Svaneti on Horseback: What to Expect. 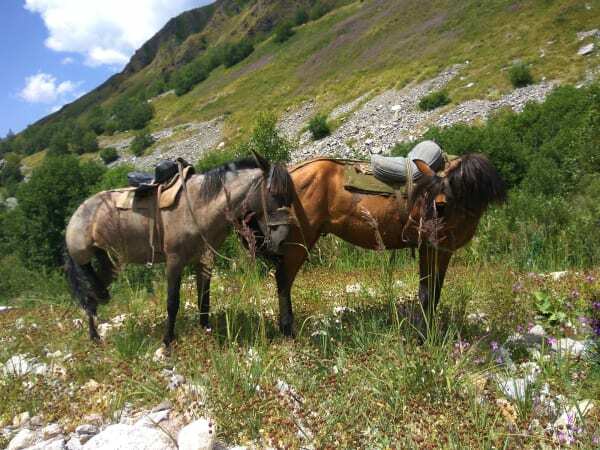 We had arranged for horses the day before – there are several guesthouses with a “rent a horse” sign. We named the riding arrangements “Kitty’s nightmare”. Kitty is the owner of the stables we used to ride at regularly since it is close to Berlin (where we are based). The horses there are taken care of in the best possible fashion – to such extent, that almost half of the time it was too hot or too cold for them to be engaged in the activity of riding. 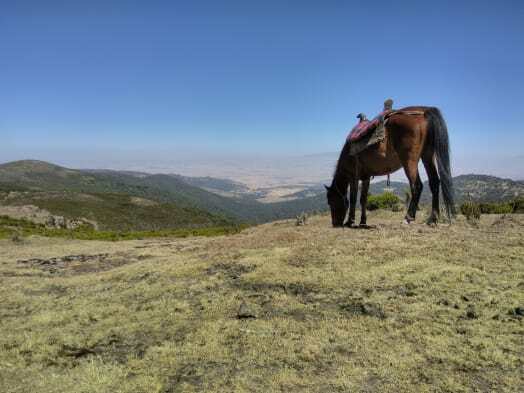 The riders’ skills are carefully examined during a trial ride before one is actually allowed to participate in a guided riding tour out in the forest. The riders are well equipped with helmets, vests, even riding pants if they happen to not have any on their own. But well, this is common for many German stables. Now we come to our Svan arrangements. Sure, we didn’t get any helmets or vests. What we got was an unusual saddle, a metallic carcass with a cushion and really really short stirrups which one couldn’t adjust to make them any longer. The first part of the road, shared with 4x4s, bringing hikers to the actual beginning of the trail and the vast majority of regular hikers was suitable for trotting and cantering. But we didn’t hurry and took some long breaks to give our horses some rest. When the path gets narrow you may still continue on the horse’s back but at a slower pace. After a while getting forward turns into jumping from one big stone to the next, which is better executed separately from the horse. And then we faced the truth: the path would just get worse and steeper as well. 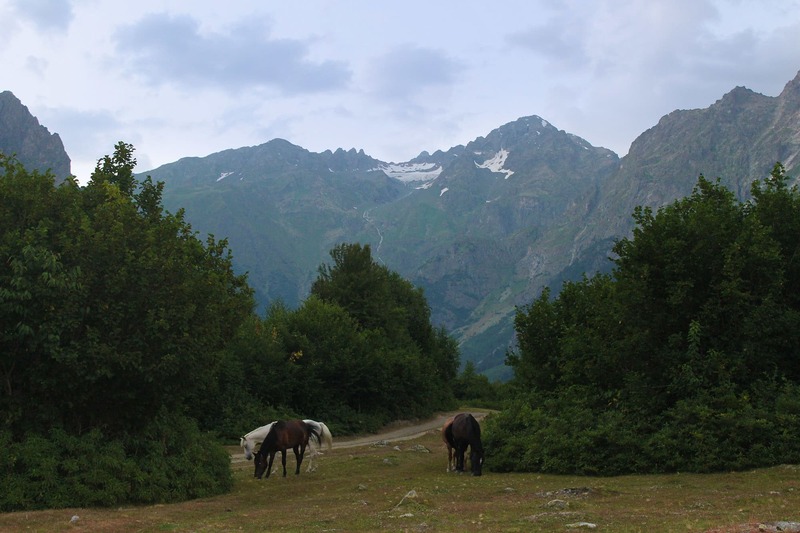 We also figured out why the other horses had been tied to trees at the beginning of the narrow trail – closer to the glacier there were hardly any trees. On our way back we let our horses run on the broader road as fast as they wanted to go and reached the village in 4 hours after we had left. But the saddle and the stirrups had soon made our knees and butts sore and so we returned our horses. Had the saddles been any better we would have kept the horses till sundown. The proud price we paid for renting the horses was 50 Lari – 18 Euros for a day. Having checked all of the four small shops in town we finally had got some water, bread and cheese and left for the next village. 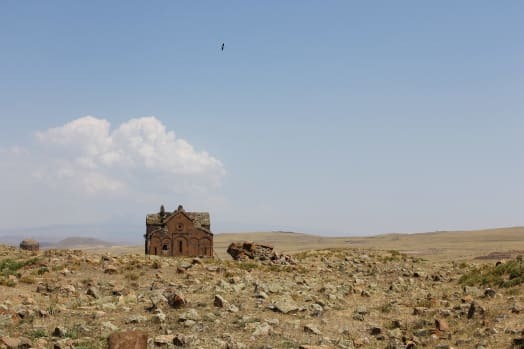 We drove about 6 km – which took us half an hour – thinking back of Ushguli and thinking that we were hardly likely to find another place as scenic and suitable for our campsite as the one we had had there, and for the first time in our journey from Berlin to Georgia we returned to a place we had been at before. Chapter 3. 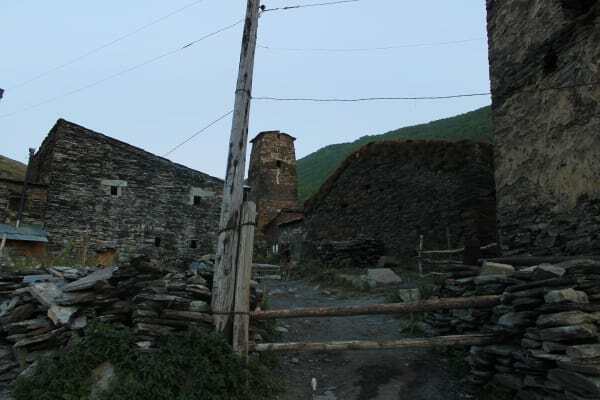 Mestia’s Ethnographic Museum – a Must See! 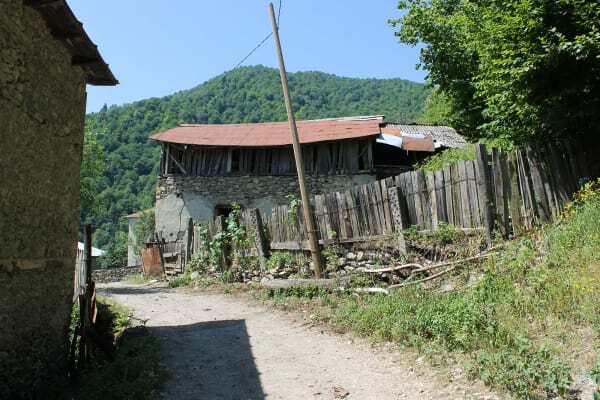 What I really wanted to see in Mestia was its Ethnographic Museum I had heard a lot about. 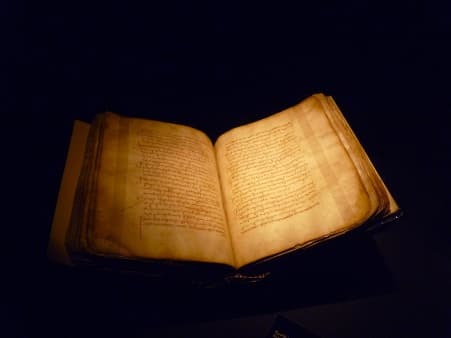 It is there that the ancient Bibles and Icons of Upper Svaneti are exhibited for public display– unfortunately, all the churches we tried to visit were closed so the museum was the only chance left… Just think of it – in the 9th or 12th century a mountain community cut off from the rest of the world produces masterpieces: icons, dozens of books out of the skins of 300 oxen each. Apart from ‘religious’ expositions, the museum also had rooms dedicated to utensils, cloth and jewellery. 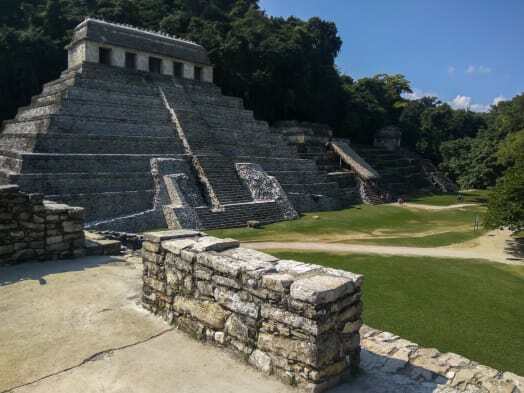 What concerns the museum artefacts – surely, they are priceless. It was visible that they had recently invested some effort into the museum: subtitles were in Georgian and English (not Russian! ), the museum offered a platform for temporary art exhibitions and the staff was young and friendly (no old ladies knitting their socks in the corners of exhibition halls like it often used to be in the Soviet museums and is often the case in many museums in post-Soviet countries). But still, I had the impression they missed the mark. 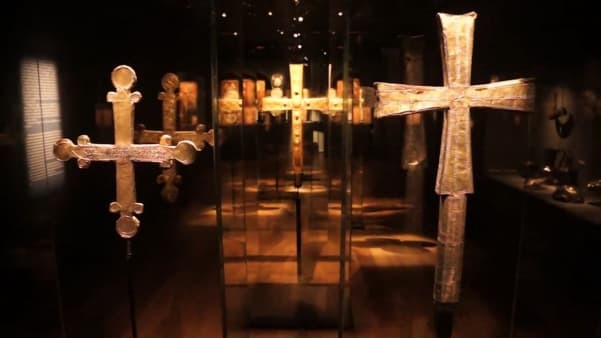 The message I got from the artefacts under the spotlights was that the ancestors of the Svans were the greatest artists, craftsmen and most earnest Christians or believers in their ancient gods. But this is exactly the kind of message I would not like to get in an ethnographic museum – no matter where it is in the word. Hardly any new topics or inconvenient questions, no other perspective. 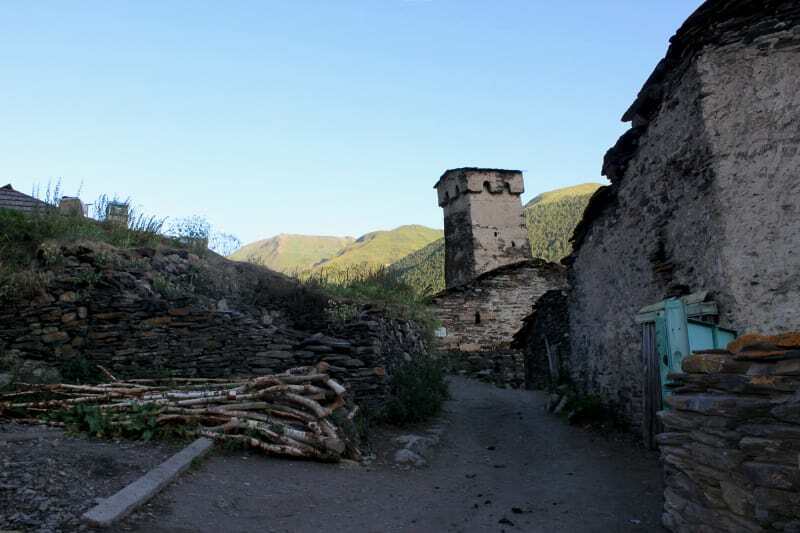 I am new to Svaneti and I don’t know what this other perspective might be, but even the Soviet movie from the 1930th offered a new perspective (the role of women in a patriarchal society) an ethnographic museum in a free state failed to offer. 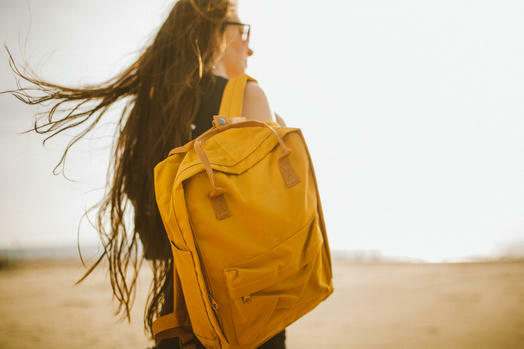 After some time we left Mestia in order to find a less inhabited place. We drove further west and turned from the main road to the village of Mazeri where we found what we were looking for. A perfect place for a campsite was behind the village, by the roaring river, hidden from the main road by a bunch of trees. In the evening, a few horses popped into our campground again and kept us company. 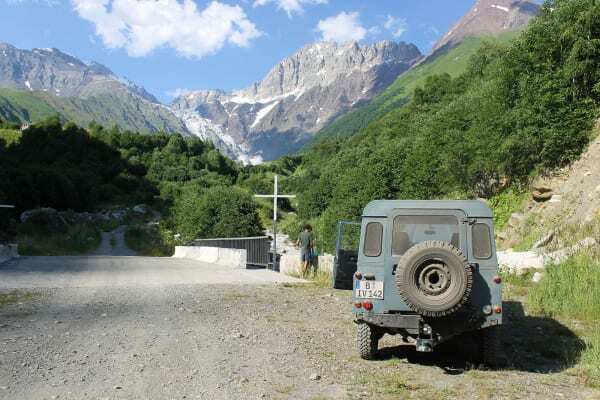 In the early afternoon, we left our Land Rover in the shade of some trees and headed to the glacier of Mazeri. 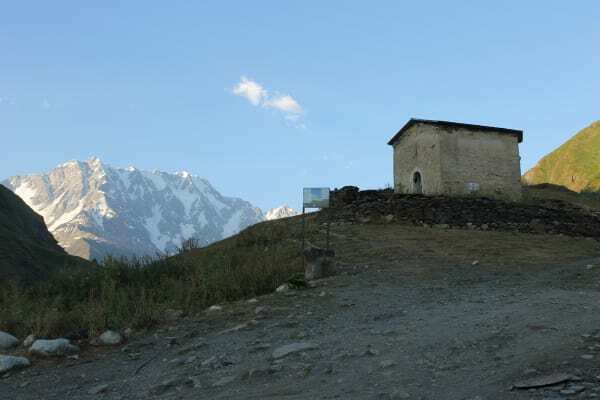 The road was broad and suitable for a 4×4 at first but then it turned into a steep and narrow path. After we crossed the bridge over a roaring river (it looked like if you were to fall into it you’d be dead the same second) we found a bigger basecamp. 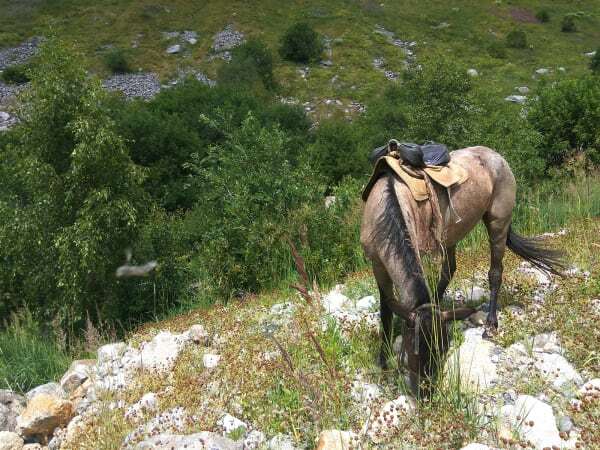 Some travellers left their horses there – an indication that the path would get even harder. 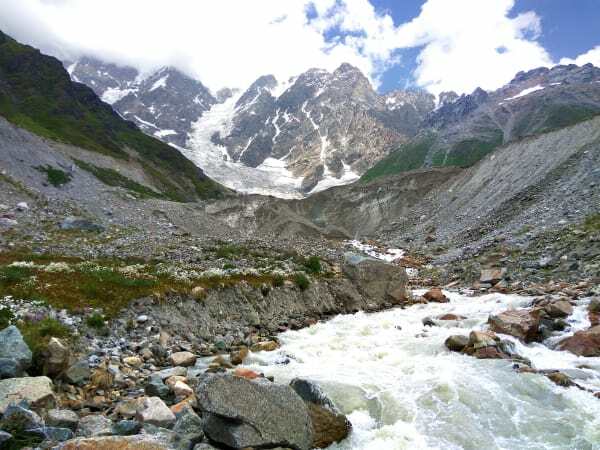 It really got steeper and less navigable in the dense vegetation that was about a man’s height, sometimes we lost the trail and trekked through the basin of a small stream until we found it again. 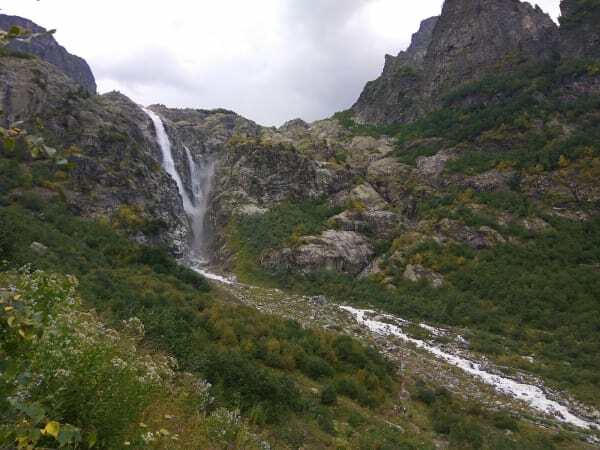 Two spectacular waterfalls that we found on our way were finally declared to be our turn around point as it suddenly looked like a thunderstorm was approaching. 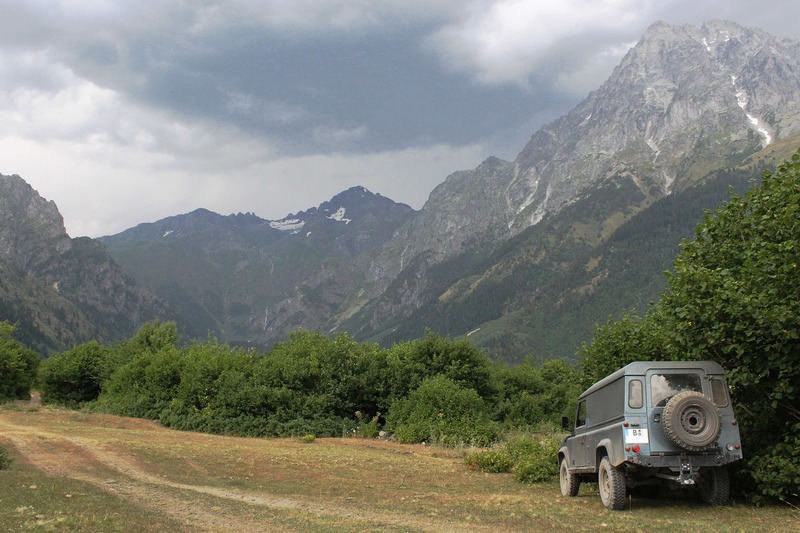 Even though a heavy rain and dark clouds stuck to the highest mountains in the north and were about to subdue all the surroundings we didn’t want to hurry up and leave Upper Svaneti on that day. We drove slowly along the main road from Mazeri to Jvari checking the backroads for a good spot for our campsite. But there was nothing – we ended up driving the whole way down, parking close to the Jvani Reservoir by the main road. 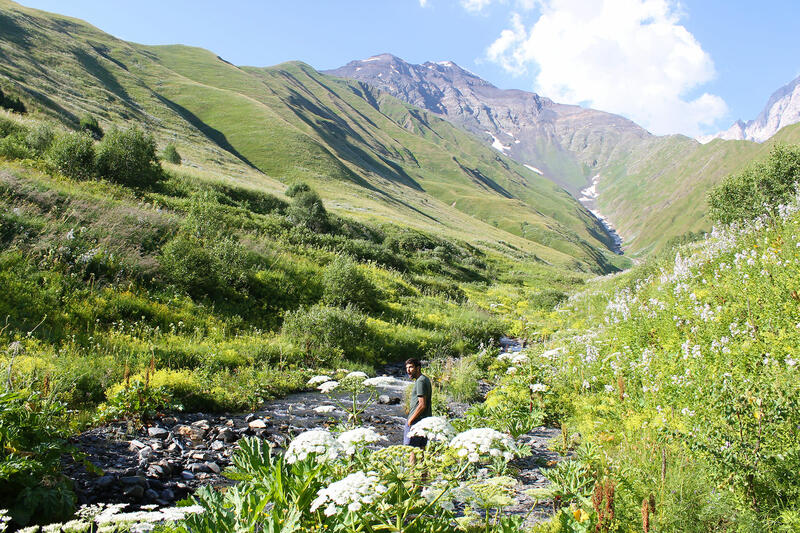 For the ones who want to follow our footsteps, I should mention that we saw no places suitable for a campsite on our way from Ushguli to Mestia either. Neither were we able to find one near Mestia. 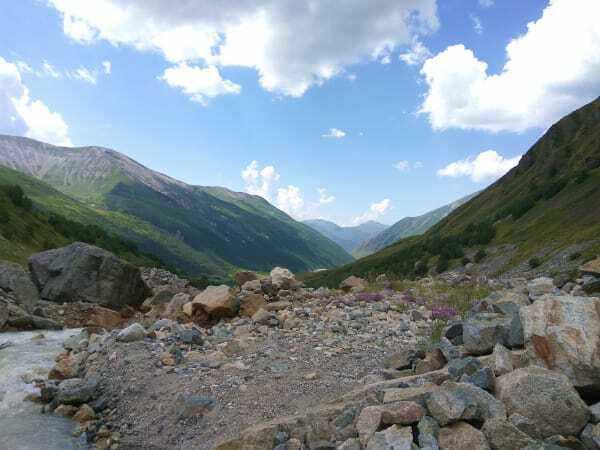 The road north of Mestia was under construction and the passing trucks produced a great deal of noise and left even greater clouds of dust on the poor hikers en route to the glacier at Mestia. A patch of slightly forested terrain alongside the road was an option but frankly speaking not a brilliant one. 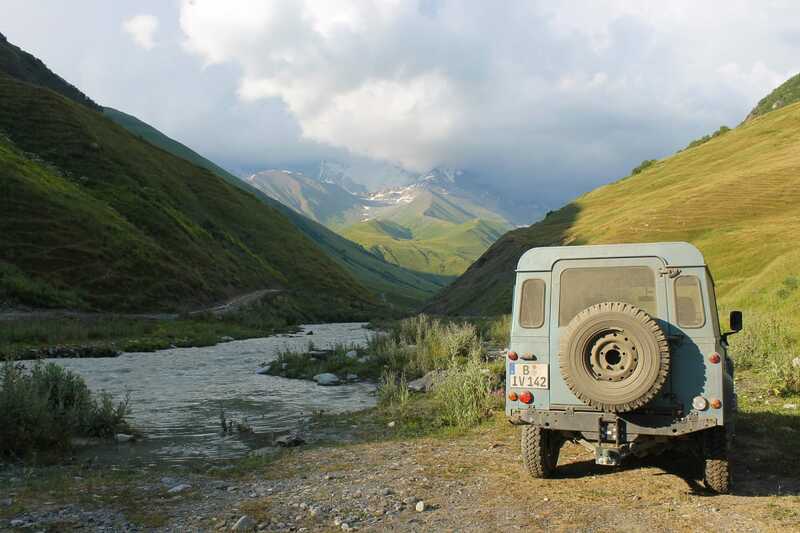 From our experience, Ushguli and Mazeri are the only two places suitable for a 4×4 campsite. But then again they are pretty much the best ones that we had found during our entire drive from Berlin.